Cyanotype Store Fabric Squares are 100% Cotton. The Mixed Colors pack includes 5 each of the following: violet, lime, raspberry, orange, and turquoise, for a total of 25 fabric squares. 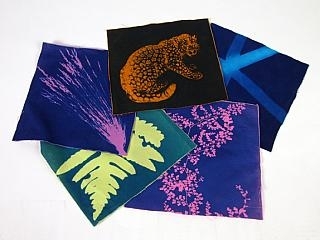 Each piece of fabric is coated with Cyanotype solution which, when exposed to sunlight with objects or a negative placed on top, will yield a color image on a blue background. Can be pressed with a warm dry iron before printing to remove wrinkles. Simple to do. Just place your image or object on the Cyanotype Store fabric. Set it out in the sun for 10 - 15 minutes. Remove your design from fabric and rinse in water, until the water runs clear. Conforms to ASTM D4236 regulation stating that this product can be used safely as an "art material" or "craft material" used by children and is Non-Toxic.